When I was working for a large municipality, I found some software upgrades sort of overwhelming, even when I liked the new features. To feel more comfortable while I learned the new environment, I always created a sort of “home page” to get comfortable with the new views and organization. I will post the steps I took and a couple of more screenshots, in case you’d like to try this approach. This post has a screenshot of my “home page” for QB. It has restored my comfort level even though I haven’t mastered too many of the new tools that are now available. 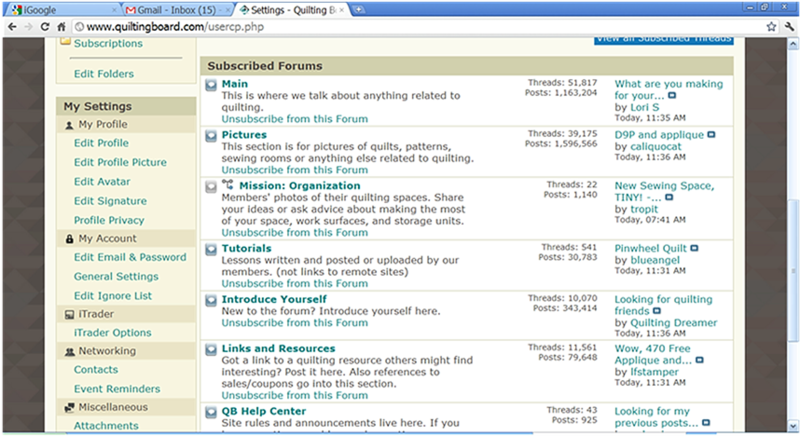 It shows only the Threads and Forums I want to see when I log in to QB. I will post the steps and other screenshots in other posts, so read on if you think you'd like to do this. When I opened QB and clicked on HOME, I saw a list of all of the forums and a green circle with a check mark to the right of every forum, indicating that I was subscribed to that forum. But, none of them showed up as “subscribed forums” under my SETTINGS. 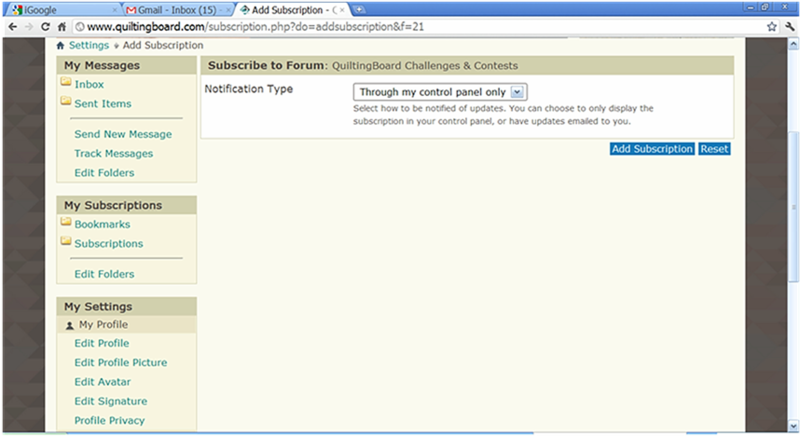 It seems that you need to populate your “subscribed forums” list manually…but it seems you only have to do this once. So I went to HOME and opened each forum one at a time. At the top of each forum list there is a cream-colored bar and toward the far right on that bar is FORUM TOOLS. Click on FORUM TOOLS and choose SUBSCRIBE TO THIS FORUM. Then you’ll see the screen below. Choose whether you want to receive notifications from this forum only through the “control panel” (the Board) or whether you want to be notified by email. I chose “control panel” to cut down on the number of emails I receive. Be sure to click the blue ADD SUBSCRIPTION button when you’ve made your choice or your choice won’t “stick.” Do this with each forum. Now you’ve populated your “subscribed forums” list and can customize it as you want. Okay...I still have a lot to learn about posting and pictures and this is several steps, but you can have your own “home page” and have filtered out the forums you don’t want to see on a regular basis. You should also have your “subscribed threads” at the top of the page. You can unsubscribe from any threads that you no longer want to watch. This doesn’t affect your bookmarks. Of course, you’ll still need to make some other choices about how you want to view Threads, how many days’ worth of Threads to display etc. Those choices are under SETTINGS-MY ACCOUNT-GENERAL SETTINGS. Any time you want to see the full list of all available forums, just click on the Home button. When I finish reading posts in a forum, I click on FORUM TOOLS and select MARK THIS FORUM READ. The threads will still be there, but the little envelope will be gray to show I’ve read that thread or marked it as read. This “home page” has helped restore my comfort level again….now I can work on learning all the other tools. Using my SETTINGS page makes QB feel like home again! Now I can learn the cool new features! Sorry that the pictures are so large, but it was the only way I could get the screen to be legible. If you'd like to have these steps by email, drop me a PM and I'll send them to you in a Word document. Well, aren't you helpful? A kind soul. I previously thought of doing that, but did not want ANY notifications, through control panel or otherwise. do you get notifications? Thank you SO much, Anita and to all the other members finding way and method to help us all get the most out of the new QB. You guys are very much appreciated! I'm copy/pasting all of these into my own word document! Thank you! All help is appreciated and you did a great job of explaining this. I'm a retired teacher and now I enjoy being the student. This was VERY helpful, and easy to follow. Thanks so much for making it very clear. 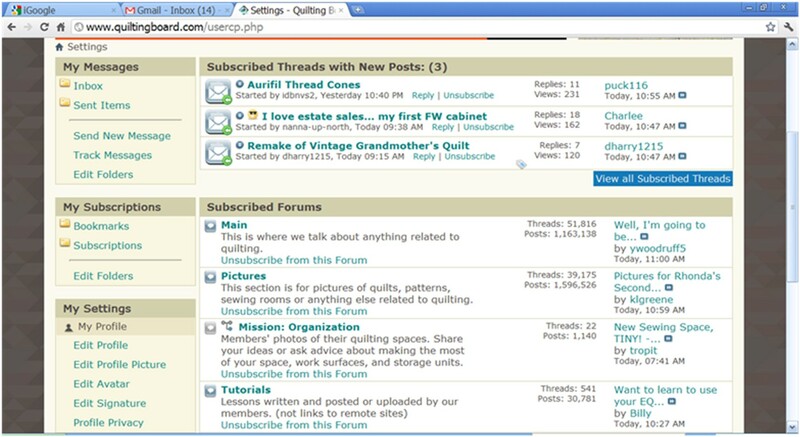 I carried it one step further, and bookmarked the "My Settings" page, so all I have to do is open My Bookmarks on my web browser, and click on "My Settings, Quilting Board" and it opens. Lived in San Diego now retired in Eagar, AZ. when you do the "mark forum as read"...will it change colors once new posts are added to it...I like the idea of that feature, but just didn't know if it lets you know once a new post has been added? Thanks for all your tutes...they were very helpful. A profile picture appears on your profile, and an "avatar" appears when you post things. Go to your settings page, then look for "edit avatar" and "edit profile picture" link and click there and follow prompts. Remember that avatar and profile pictures must be very, very small, something like 100 x 100 pixels.